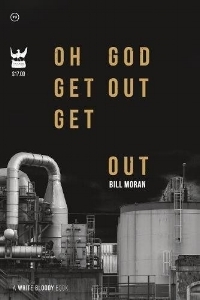 Bill Moran has had two books of poetry published, in addition to the several individual poems that have appeared in various journals. He has also written a sci-fi screenplay for which he won an award, and various critical essays on hand. Bill tours several times a year, at roughly 30 shows annually. He is interested in multi-modal performances, and plays original music live while reading his poetry. He has performed extensively throughout US, Australia, Singapore, Malaysia, and Thailand– in venues ranging from Bangkok dive bars to the University of Chicago, and everything in between. As a two-year president of a poetry non profit, Bill ran weekly public writing workshops, and several long term poetry programs at a nearby juvenile justice center. He has also led a weekly poetry program at his local homeless shelter, and has taught a handful of English classes at Louisiana State University. While on tour, he spends his days holding generative writing and performance workshops at high schools, universities, or local community centers in whatever city he's passing through. Outside of the literary arts, he's also an avid musician and songwriter, composing and recording his own track music for live poetry readings– and even playing music live while reading poems. His music/poetry albums can be found at his Bandcamp page here. Zane Timpson's video for my poem, “Bowie Knife”. Stay tuned for future collaborations with this super talented visual artist! Live video of my final show for the "Oh God Get Out Get Out" book tour, right in my hometown of Houston, TX. Thank you Write About Now for the video! Courtesy of Write About Now Poetry. Courtesy of Melbourne Spoken Word. "i'm walking through a haunted house in Louisiana and won't keep my big mouth shut"
If you'd like to book Bill for your poetry reading, slam, classroom, or whatever else– please drop him a line here! Make sure to leave your email and phone number, event and/or class information, potential dates, and what you have in mind.